Other: Profits before people: contamination of the entire planet with lead via leaded gasoline, lead poisoning of billions of people – everyone alive since 1953.
that use of the product would stop or delay millions of car buyers from updating to a car with a catalytic converter, by which action drivers can reduce their vehicle emissions by 50 - 90% ( www.unep.org/transport/pcfv/PDF/pcfv_leadflyer.pdf ). Graphic: Entry in Volcano Art Prize 2013. Artist: Zac Gethin-Damon. Title: Lead kills catalytic converters. 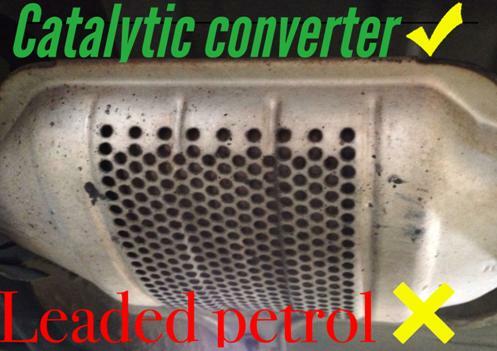 Lead-Safety Message: Catalytic converters reduce auto-emissions by 50-90% and when leaded petrol is no longer sold in a country, catalytic converters can be made mandatory in new vehicles. (http://innospec.ir.edgar-online.com/EFX_dll/EDGARpro.dll?FetchFilingCONVPDF1?SessionID=n-kl6Q15KiV7f1v&ID=8422270 ). The lost opportunity for cars and whole countries to switch to using unleaded petrol and thus catalytic converters to reduce emissions, has not been costed. At the beginning of 2013, Kevin Drum wrote: “Gasoline lead may explain as much as 90 percent of the rise and fall of violent crime over the past half century” and the cost benefit of lead abatement? Invest US$20bn annually in lead abatement and the return is US$210bn annually [in the USA]. 2000 - European Union bans leaded gasoline at the pump (http://www.thenation.com/article/timeline ) yet Innospec continues to export TEL for MOGAS from UK. 2002 – World Summit on Sustainable Development (WSSD) results in the United Nations Environment Programme (UNEP) setting up the Partnership for Clean Fuels and Vehicles (PCFV) with the primary goal of global elimination of leaded petrol. Canada also produced TEL for MOGAS up until 2002, but Innospec went on producing it after the UNEP PCFV resolved to eliminate leaded petrol globally by 2008. Today, Innospec still claims to be the world’s only manufacturer of TEL. In 2010, Innospec was found guilty but only fined $40.2 million, for bribing Indonesian and Iraqi officials to purchase TEL for MOGAS, despite the bribery netting Innospec $60 million – thus proving that even after being caught bribing, they can turn a profit from TEL for MOGAS. Innospec is an inspiration to its own staff and other corporations, to bribe foreign officials to buy their toxic products, no matter what the public health and crime increase consequences. Their profit motive is clear – it’s in the heading – and they are very careful to state they are in a “position to help developing countries make the transition to unleaded fuel” without providing any evidence that they actually are helping developing countries make the transition to unleaded fuel, eg by telling their purchasers that other companies make non-lead octane additives which could, within a matter of weeks, enable the phase-out of leaded fuel in their country, thus enabling the introduction of regulations requiring all new cars to be fitted with catalytic converters, to further reduce auto emissions. While Innospec’s website makes claims that they are assisting countries with their plans to switch to unleaded petrol, the focus of their annual and quarterly reports is always on postponing that switch, in order to maximise Innospec’s profits, by continuing to supply as much TEL as possible, for as long as possible. Innospec's record of putting profits before people and proudly claiming to be the world’s only manufacturer of TEL, shows flagrant disregard for the UNEP Partnership for Clean Fuels and Vehicles (PCFV) to achieve the UNEP Partnership’s major goal of global elimination of leaded gasoline, which the PCFV had planned to achieve in 2008! Innospec Inc. stated in its 2009 "FORM 10-K ANNUAL REPORT" - "We intend to manage the decrease in the sales of TEL for use in automotive gasoline to maximize the cash flow through the decline." Innospec Inc. stated in its 2010 "FORM 10-K ANNUAL REPORT" - "The Company expects that it will cease all sales of TEL for use in automotive gasoline in 2012." Further back-pedalling is evident in the 2012 "FORM 10-K ANNUAL REPORT" - "We expect to cease sales of TEL for use in automotive gasoline in 2013, however this is dependent upon the phase out plans of the remaining countries as they transition to unleaded gasoline." On 14 January 2013, after Friends of the Earth and Greenpeace called on the UK Government to ban Innospec Ltd, from further exports of TEL; Innospec told The Independent: "We have no comment to make [on UNEP’s findings of TEL linked to death and crime]" and confirmed that it continues to provide the TEL used in motor fuel in Yemen, Algeria and Iraq. By 2014, six years will have passed since the UN target for the global elimination of leaded petrol. In the three countries Innospec admits to still supplying TEL for MOGAS, 88 million people continue to be totally unnecessarily exposed to lead from petrol every day. How many more millions have to die so that Innospec can keep raking in the profits? Has the company promised to abide by other agreements, conventions, or guidelines? If yes, what are they? Answer: No. Innospec Inc’s Code of Ethics (August 2009) at http://www.innospecinc.com/corporate-governance/code-of-ethics---english.pdf only requires Innospec operatives to comply with the letter and spirit of the law, and confidentiality and other agreements they sign with the company. Why nominate (your own motivation)? What do you hope to achieve with a nomination? Answer: if Innospec is correct in its claim that it is the only manufacturer of TEL in the world, then by focusing attention on Innospec, they may actually stop manufacturing TEL for MOGAS, which would inexorably lead to the end of leaded petrol, thus bringing about the world’s first global elimination of a toxic chemical. Has the company been confronted with the accusations raised against it? If so, what was the result? If not, why not? Answer: Yes The LEAD Group contacted them directly via dozens of emails and an online Petition. Innospec did not reply or take any action in response. What steps were taken to stop the accused company’s actions (state of your own campaign)? Answer: [The following is supplied in confidence – apparently the UK Serious Fraud Office does not tell companies WHO has alleged fraud by the company – please do not web-publish the remainder of this answer.] After they were reported to the UK Serious Fraud Office, some of Innospec’s fraudulent online statements were removed from the web, but only to be replaced by other fraudulent claims. What further steps are planned? Answer: request to the European Chemicals Agency to speed up a complete restriction on manufacturing TEL for MOGAS in Europe. What steps are you planning to implement in order to generate a maximum number of votes (mobilization) if your nominee were to be shortlisted for the people’s award? I belong to some 14 egroups with an interest in lead poisoning prevention and/or international chemicals phase-outs, so would generate votes through my network.